There is nothing better to have in your dessert repertoire than a simple brownie recipe. This brownie is worth not opening a box of brownie mix for. It is really easy to make and people get really impressed when you tell them that the brownie that they are eating is homemade. Can you mix together some chocolate and sugar? You can? Then you can make these bad boys. The reason why I think that having a good brownie recipe up your sleeve is because it can be the foundation of so many other things. You can use it as the base of an ice cream sundae covered in caramel or chocolate sauce. Or you can crumble it up and use it as the base of a trifle. Or you can sit on the couch and watch reruns of Weeds and eat brownies until you cannot eat brownies any more. No one will know. 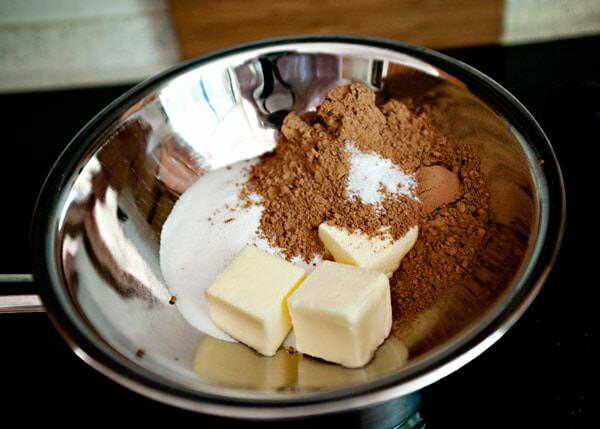 On top of a double boiler, melt the butter, sugar, cocoa and salt. Melt, stirring occasionally. Let the mixture cool a bit. Add the eggs one at a time. Add in the vanilla. 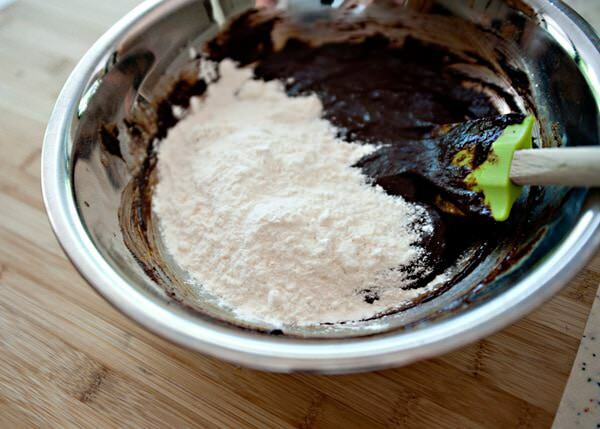 When everything is nice and combined add the flour. 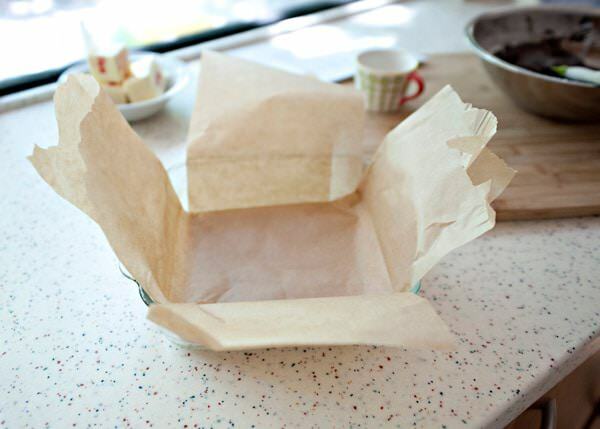 Line an 8×8 baking pan with parchment or tin foil. 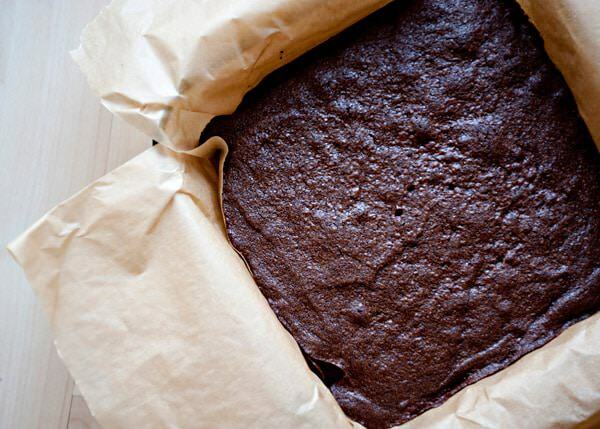 Let the parchment hang over the side of the pan so that you can get the brownies out easily when they are cool. Pour the batter into the prepared pan. Put in a preheated 325 degree oven and bake for 20 to 25 minutes. 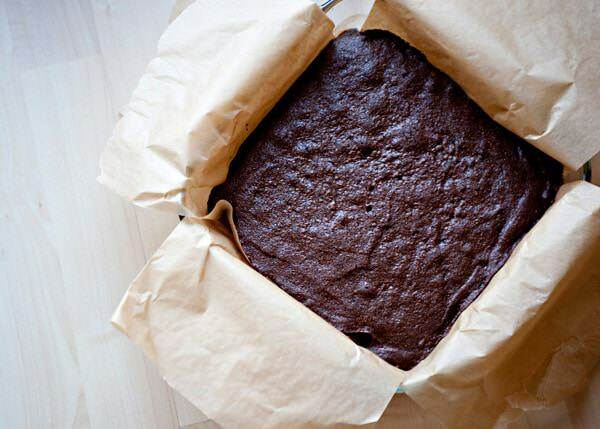 Pull the brownies out of the pan using the parchment paper and cut into squares. I can tell these brownies are good and fudgy based on the small amount of flour in it. YUM!! I use foil to line my pans instead of parchment because foil is cheaper than parchment and works just as well haha. I made this brownie recipe today. My kids loved it, thanks!!!! these look ah-mazing! when you say 1 1/4 stick butter, do you mean one stick and then a 1/4 cup or 1 stick and then a 4th of a stick (2 TBSP)? Thank you!! 10 Tablespoons. So 1 stick and then 1/4 of another stick. I already wrote you, but a stick of butter is 4 ounces. Too bad I read through the comments AFTER trying out this recipe… a stick of butter in the UK is 250g, so needless to say these were, um, a “buttery” disaster. I didn’t question it because it comes up on a UK website (yummy.co.uk). Sorry it didn’t work out for you. Here a stick of butter is 1/2 cup. And I don’t add my recipes to that site, they pull it on their own. i’m sorry. I am so glad. I really love this brownie recipe. It is easy and I always have everything on hand. I almost couldn’t make these brownies. The batter alone was just so delicious! wish I knew how difficult it was to melt before I started this! 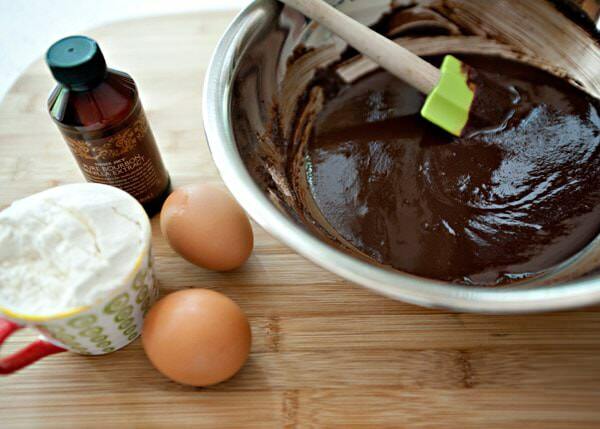 melting chocolate should not be difficult. Did you use a double boiler or microwave? 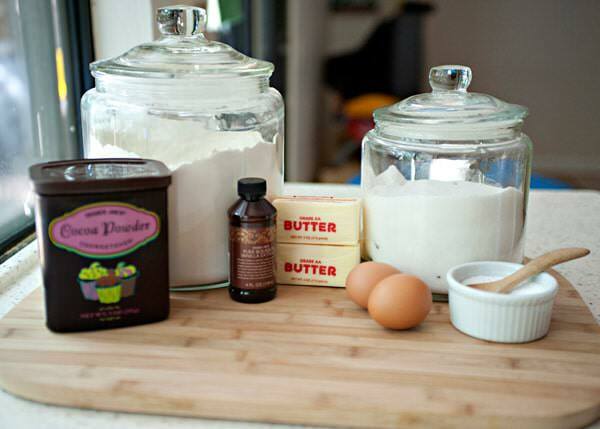 I’ve been looking all around for basic brownie recipe and I found your site. Wow, your site is really great especially for a rookie like me. Hello! I hope that it helps you out. I have tried these 3 times now and they never turn out right. I’m going wrong somewhere in the beginning with the double broiler – my mixture never looks smooth like yours it always looks grainy, by the time I get to putting the flour in, the batter is so thick I can’t even pour it. Any tips? Oh no! My first thought is that you are seizing your chocolate. Make sure that the water is at a light simmer and that the bowl you are using is completely dry. The chocolate should melt very smooth, and glossy. Also maybe try using a different brand of chocolate. Hope that it turns out for you. I followed each directions carefully, but my brownies failed 🙁 They turned out all gooey and the top was crispy… Did I do something wrong? It is hard to say, but my guess would be oven temp. Should I use the paper thing under the brownies? I made this today and it is the best brownie ever! Yum! I’ve been getting lots of compliments on it. The directions were easy to follow and the pictures were beautiful. Aren’t they good? Glad that you thought the pictures were helpful. s long as the pan fits, I don’t see why not. WOW! Very good. However, I made a couple changes (one that I meant to make and the other, well let’s just say I didn’t read the instructions first – LOL!). The intentional change was the addition of some walnuts. The other difference….never been one for reading instructions…so I put everything except the eggs, nuts and flour into a bowl, then I got out the ol’ mixer and mixed and mixed and mixed (butter was a wee it stubborn since it was fairly firm when I started out)…but I kept on mixing, then added the eggs to muck it up a bit, mixed some more, then added the flour and nuts, mixed some more….and then I started thinking I must have missed some sort of liquid ’cause boy, this was a thick mixture…but double checked and all I found was that I should’ve done the double-boiler thingie….anyway, I took the extra thick mixture, put it into the microwave for 30 seconds , then into a pan and cooked it as I was supposed to (this is where I started to read the instructions! )….and as I said earlier, these are incredible brownies, so chewie and easy to make (no matter which method you choose – LOL!). Question regarding the oven temp of 325. Is that because you used a glass baking dish? Should I go with 350 if I use a metal pan? It is because the recipe called for 325, and I followed Matt’s recipe. Do you think I should have baked it a bit longer? Yes. If they aren’t done, you need to bake them longer. Oven temps vary so the time is only a suggestion. You need to bake for doneness, not time. I made these in a jiffy and they lasted well and tasted great, tell me can I add some grated or pureed beetroot to this mixture? I baked these for my six year old daughter who demanded a chocolate brownie this very minute, so I was lucky to find this recipe and whipped them up in no time at all, she loved them and ate them for three days and they kept on tasting better each day, so I was wondering can I add beetroot to these to make them more healthy? You can add whatever you like, but I subscribe to the 80/20 rule. I eat really well 80% of the time so that the other 20% I can have a brownie. My question was, will it turn out okay if I did add beetroot but how much? I really have no idea, I have never made them with beetroot. You are more than welcome to experiment with the recipe. Wow! So glad that you like it so much. 500 grams (1/2 KG) equals 1.1 pounds. In the USA, most butter comes in 1 pound boxes (4 sticks) of 4 oz each. 500 grams equals 1.1 pounds. and 454.5 grams equals 1 pound. One ounce is 1/16th of the 454.5 or 28.4 grams and you need 10 ounces of butter in this recipe or 284 grams of butter. Hope this helps you since I did the math for you. A cup of dry ingredients is 8 ounces by volume in this recipe. I try to read thru others’ comments before I try the recipe. So I am about to try the recipe – it sounds good and I am not using parchment paper but am using a Corning bakeware pan and have never had a problem taking items out of those pans but I use a very thin flat blade “egg turner” and press against the pan very firmly. I also let them cool in the pan (so they continue to bake a little) but the pan is set on a wire rack where air can travel under the pan to help cool it. A few days wrapped well. I suppose so, but I’ve never baked with margarine. are u not supposed to add baking powder or baking soda to it??? I tried this recipe. It turned superb. Thanks for sharing. ???? my mix turned out to be too thick , what do you think was wrong with it? I really don’t know. Maybe a mismeasurement?